Weight Capacity 251 to 350 Lbs., 351 to 450 Lbs., 451 to 650 Lbs. 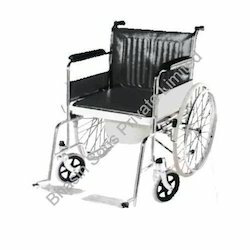 We offer a wide range of Aluminum Wheelchair with Detachable Armrest & Footrest in the market. We manufacture these products using better-quality stainless steel materials with the help of sophisticated machineries. 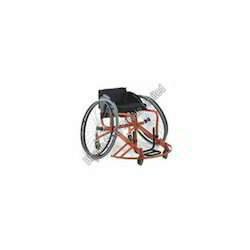 We offer these superior quality wheel chairs provided with very soft and comfort cushion seat, which are in accordance with the latest update in the technology and specifications. These products have huge appreciation all over the world. Moreover, it is manufactured in compliance with international standards. 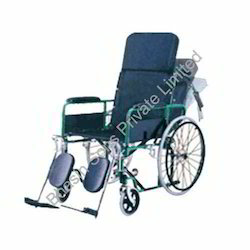 We are the leading pioneers in manufacturing and exporting Invalid Wheel Chair Folding. 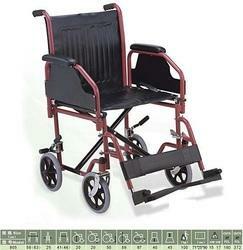 We manufacture these folding wheel chairs using finest materials, which has matchless weight withstanding capacity. We manufacture these chairs following the research modules of our skilled experts. 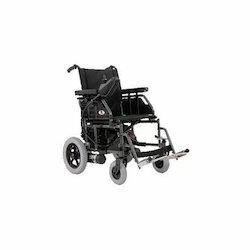 These are provided with 18" Foam padded seat, Detachable Armrest, Front with 6" Solid Castors and Rear 26" Solid Wheels with brakes. The materials used for manufacturing these cases are Epoxy Powder Coated to enhance its durability. Sports Wheelchair is one of the first-rate products that have a wider acceptance in the market. 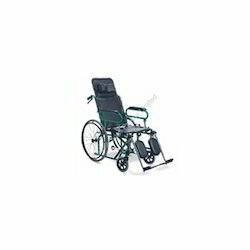 In this wheel chair the seat width is 35cm and it has the capacity to hold up to 100kgs. The product is fitted with excellent wheels, armrest and footrest which are well known for its durability. These are commonly preferred by the physically challenged sportsmen. It is well known for its flaw less performance. 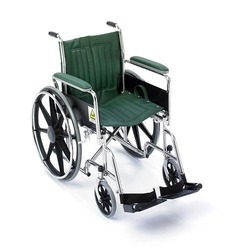 We are the leading manufacturers and exporters of a wide range of Recycling Wheelchair. Using hi-tech technology and machinery, we are manufacturing these products ensuring its extended life span. The vital features of these products are extreme sturdiness and all directional moving property, which we manufacture in accordance to meet the huge demand and the customer required design. These are widely used by many people who are physically disabled all over the world, due to its easy to use property and price competency. 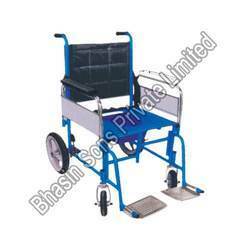 Bhasin Sons Private limited occupies the leading position in the field of manufacturing and exporting Transit Type Electric Wheelchair. We manufacture these center rests with committed care of our skilled professional to ensure delivering reliable to our clients. The efficient feature of this variant of this product is it is easily foldable. 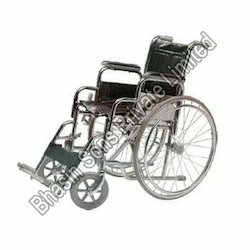 Commode Wheelchair is the best selling products, which are efficiently constructed and precision-engineered. Our professional team is keen designing these products to be in accordance with the industrial required dimension and specifications. They are well-known for its robustness and solid wheels with brakes. Moreover, these cases are provided with excellent cushioned seat & back fixed armrests. We offer these products at industry leading price to please our clients. 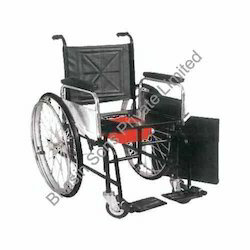 Over-all size 41"L x 28"Wx33"H, 17"
front with 5" soldi castors & rear 26"
We are well-known experts in manufacturing and exporting NON Folding Wheelchair. We manufacture these battery cases using finest quality raw materials available in the market with the help of sophisticated technologies and machineries. These chairs are manufactured in accordance with the international standards and compliances and so we are certified by ISO 9001: 2000 for prompt delivery of the best quality products, which has huge appreciation. Front with 4" Solid Castors & Rare 26" Solid Wheels with brakes. 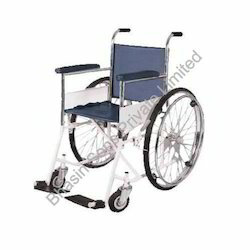 Having well organized distribution network, we offer an assorted range of Wheel Chair Folding with Commode. These wheel chairs are manufactured using higher quality raw materials to ensure its extreme durability. These chairs are mostly used physically challenged peoples all over the world due to its user-friendliness and easy to use property. The foldable frame is made of high-grade chrome plated sleet alloys, which is durable and rust-free. Comprising hi-tech infrastructure facilities, we are able to offer a wide range of Wheel Chair Folding Ordinary. We comply with research modules of our dexterous professionals for the process of manufacturing these wheel chairs. These products are evident due-to its matchless reliability and application. It has a wide range of usage being the basic kind of wheel chairs. We offer these highly-prized products also in customized design and size features.